The Chalara fraxinea isolate KW1 was tested for growth in the presence/absence of two compounds; a traditional fungicide (compound A) or an inhibitor of the putative alternative oxidase protein identified in the C. fraxinea proteome (http://oadb.tsl.ac.uk/?p=526) (compound C). Agar plugs of C. fraxinea KW1 isolate (5 mm diameter) were used to inoculate glucose agar plates or potato dextrose broth, supplemented with 1, 1.5 or 2 uM of compounds A or C (Figure 1). DMSO was used as a negative control. The presence of compound A reduced C. fraxinea KW1 growth. 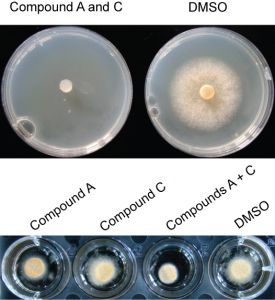 To further access the inhibition activity of the two compounds, agar plugs of C. fraxinea KW1 isolate (5 mm diameter) were used to inoculate glucose agar plates supplemented with 1.5 uM of both compounds A and C or DMSO. 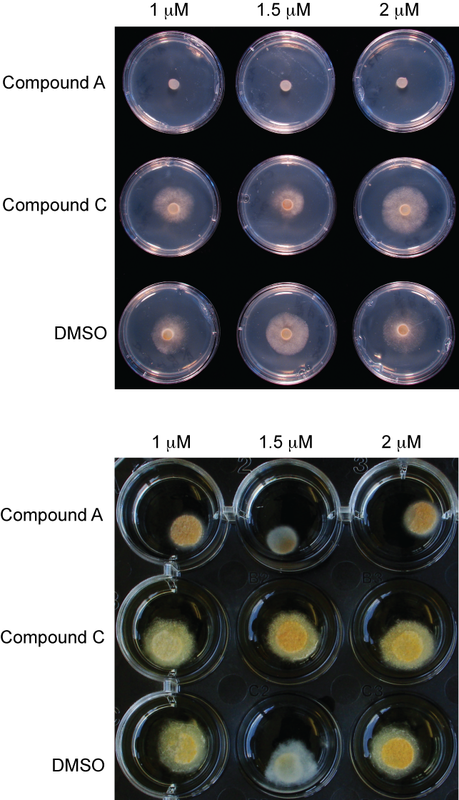 Agar plugs in potato dextrose broth were supplemented with 1.5 uM of compound A, C, both combined or DMSO (Figure 2). When both compounds were combined there was a significant reduction in C. fraxinea growth in culture. Three biological and three technical replicates were undertaken for each experiment. Figure 1. Compound A reduced C. fraxinea KW1 isolate growth in culture. Agar plugs of C. fraxinea KW1 isolate (5 mm diameter) were used to inoculate glucose agar plates or potato dextrose broth, supplemented with 1, 1.5 or 2 uM of compounds A or C or DMSO. Pictures captured 12 days post-inoculation. Figure 2. Combining compounds A and C significantly reduced C. fraxinea KW1 growth in culture. Agar plugs of C. fraxinea KW1 isolate (5 mm diameter) were used to inoculate glucose agar plates or potato dextrose broth. The plates were supplemented with 1.5 uM of compounds A and C or DMSO. The liquid cultures were supplemented with 1.5 uM of compound A, C, both combined or DMSO. Pictures captured 15 days post inoculation.